The Nady SSM-3 Shock Mount fits Nady SCM 900/910/920/1000 and TCM 1000 studio microphones. 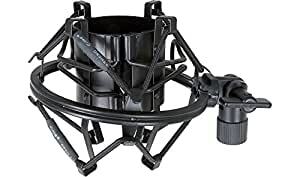 I'm currently using this mount with an "Audio Technica AT2020 Side Address Cardiod Condensor Studio Mic" and i must say it fits snug, and does actually prevent sound from movement. 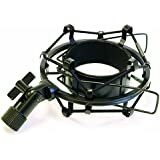 It's very easy to install simply screw it on the mic stand, and pull the two clips back while sliding the mic into position. 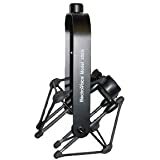 This shock mount is also very well built compared to others in it's price range, as well as having a nice feel, and look to it. It's all black, and metal except for the nylon bands. I'd give this product a 5 out of 5 for its over all convenience. 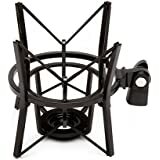 Not only does this shock mount prevent ambient bumps and whatnot from getting to your microphone, it looks cool too. 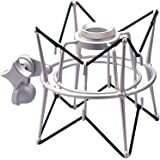 I'm using this with my AudioTechnica AT2020 USB Condenser Microphone, and this shock mount does the job. I literally have to either beat the stand the mic is attached to in order to get any sound to pick up in the AT2020. A great shock mount, and a great price. Its all black, and it has a nice "spider-like" style to the way the elastic is strung, so it looks really nice with my black AT2020. Definitely a cool mount. 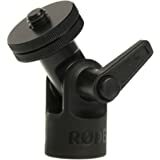 I hesitated a bit before ordering this shock mount, thinking that the cheap price would mean a flimsy or poorly fitting device. But I'm pleased to say that the construction is quite solid, and the fit, while tight, is very strong and in no way damages the microphone (an Audio Technica AT2020 USB). Altogether I'm happy with this shock mount, and I would recommend it to any other AT2020 owners. This shock mount was exactly what I was after. Well made. Perfect fit.